In case you hadn’t realised its the UK Excel User and Developer conference this Thur Fri and Sat. The chances of me fitting in any blog posts are slim to zero so dont hold your breath for the next ribbon moan. Actually I think I have run out for the time being (although I’ll be doing some 2007 stuff at the conf, so I’ll no doubt be raging and ranting next week!). I’ll probably start on the xll series next week too. I’ve just posted info for the social side of the user conf. Hope to see some of you in the pub tomorrow night. I saw this link via DDOE to some analysis the Office developer assistance team have been doing. They have been analysing the usage of the on-line help resources. Thats great, my concern, and the driver for the post title is in checking the validity of the dataset. Office dev help is on-line by default, so they can look at what people are looking at on-line and extrapolate what ALL users are doing. Most Office devs will install dev help locally (I have). Data about on-line usage cannot be used to infer behavoir of the population. The sample is biased and not representative. We have already suffered due to one of these invalid data sets. With the dreadful data they used to justify the dreadful ribbon. Of course plenty of people suspect other factors actually drove that development, and the data was made up to justify it later. I find it worrying that the unprecedented usage data that folks at MS now have is not tempered by a reality check of how representative their samples are. In fact their fundamental problem seems to be mistaking a biased, invalid sample for the entire population. I’m not any kind of statistician, so one of you can probably give the proper name for what I’m on about. And let me know if you agree or not. So they optimised the UI for all the novice users who allowed the user experience program, thereby making Excel 2007 almost unusable for experienced users. And now they are in the process of optimising the help for all the inexperienced devs who went with a default install. Looks like VBA is going to be unusable in O14 (well the help bit anyway). Mind you I can’t see anyone at MS losing any sleep over that. Can you? Do you have VBA help installed locally in 2007? Yes we all know I’m no fan boy. but even so. And we all know that its a big clumsy screen stealer, but I thought it would be worth comparing it to Firefox, and Firefoxs’ powerful and effective themes. Office 2007 seems to have made a half hearted (or half arsed!) attempt at themes. Here is the default one. here is a smaller button version for people who want to use their screen for work. here is pimpzilla for people who like some bling with their surfing. I don’t particularly think themes or skins are mission critical, but I do think if its worth doing at all its worth doing competently. Firefox does that I reckon. Seriously, whoever thought that blob was good User Interaction design should be relieved of all UI responsibilities and transferred to marketing or packaging design or something. I’m not saying its ugly (it is though, now I think about it), my point is that is misleading – no one thinks its a button to press. Let alone the only useful one. Whoever came up with the bright idea to make it flash on first use to alert people that its a functioning part of the UI not some sponsorship image should be promoted to management, away from the front line of UI design. The flashing is a good compromise to take the edge of an appalling piece of UI design. But overall its still a weak user experience. LOOK AT THE SIZE OF THAT THING!! Bloody hell its absolutely massive!! I did a O2k3 install recently too – by default you get 1 row of menus and 1 row of toolbars (probably half the vertical space the ribbon needs to present its pointless commands)- the Excel team know we need some space for our work. The ribbon is clearly the work of Word/Outlook clickers, who have never even done a shopping list in Excel. I am genuinely relieved to be using Office 2003 (and OpenOffice). 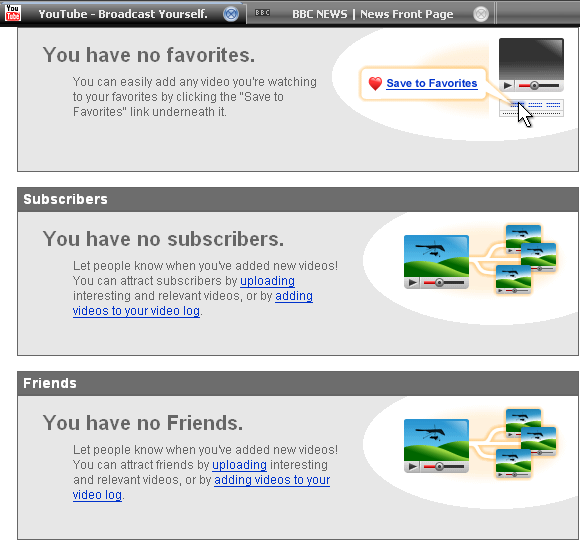 No favourites, no subscribers and No Friends! And that from a web site named after a traditional Glasgow insult! I click around trying to remember which one of the apps I’ve never used has VSTA, Google a bit follow some instructions and come to a dead end. ‘Feature not available’ the installer says – hmm. More Googling gets me here. In summary to use VSTA you need .net framework 2.0 (or higher presumably) and the MSXML security hole. So I then have to go and download these 2 components install them on the VPC (which meant a whole additions/networking dance (3 reboots I think)) then rerun the Office installer (glad I left the temp install files on there) and now I think I’m in business. I havent had chance to check because I’m trying to get all the VPCs built for next week – I could have done without this multi hour diversion. And I don’t want to use up my 20 odd uses and end up locked out for the conf ;-). But the big question is, if Office 2007 has a dependency on .net framework 2.0 for some of its functionality shouldn’t it distribute the framework as part of the Office install? (at least on those versions that include VSTA)? At one point last year I had to delete a load of important application data to make room for some beta I was messing with. The image files seem to explode in size as the install goes on, then don’t really shrink back once the temp files are removed. So what I did this time was work on a big (usb) external drive – performance wasn’t shining but I’ve had a spare machine chugging along all day. The files got up to 15Gb which would be the ditching data zone on a laptop, then down to 10 or 12 after compacting. I should be able to squeeze them on my laptop for the presentations. Compacting is actually straightforward once its been explained well (see above). Have you got any useful VPC or VMWare tricks we should know? So VS2008 is out the door and opinions seem favourable so far. I may well move to it next year. They are having a major C++ refresh out of cycle, Q1 or Q2 next year to bring in a ton of new stuff, bits of boost, and Vista MFC stuff amongst other things. I read this as a major shift in policy for Microsoft. All non .net code has been discouraged for years, and the view seemed to be whatever it is, if you are using MS tools and targeting Windows then thou shalt use .net (and C# in particular). The new C++ bits coming in VS2008 say to me that MS has realised that native code is more appropriate in some circumstances. About time. I also think this gives the C++ language on the MS platform a new lease of life. I’d love to know the reasoning behind the move. Delphis continued success?, poor adoption of CLI? Internal dev rebellion? Others? Am I reading too much into it? Anyone else interested? I’m already looking forward to the Excel 14 SDK with lots of C++ goodness (??). MSDN subscribers can download it as of today. Dunno when it will be widely available – do you?